One of the basic ideas of this blog is that photographs can depict more than what was happening in front of the lens. This added value can include highlighting larger patterns and processes and also providing imaginative projections of current tendencies. This is what some artists try to do by writing, and science fiction is particularly keen on exploring possible technological and political consequences of present tendencies. This comparison came to mind when I saw this photograph from Afghanistan. 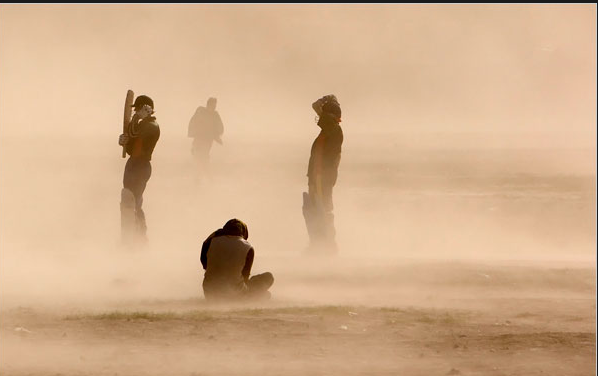 The caption confirms that these are cricket players in a sandstorm. It also adds that they are on a “playground,”but something seems lost in translation. The scene looks more like something out of Dune (the book, not the movie). Recreation on the desert planet Arrakis may not be a lot of fun, but we can marvel at how humans can adapt to anything. At the same time, the imperial influence seems to be alien and superficial rather than any genuine improvement of the place. The storm and much more may pass, but there is something poignant about this image of human beings defined by arbitrary rules and shared isolation on their desert planet. With this photo sitting on my desktop, I wasn’t entirely surprised when a second appeared a few days later. 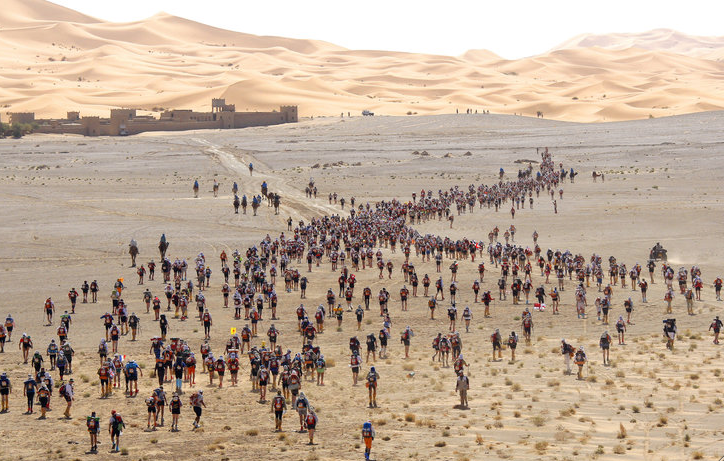 You are looking at the competitors begin the 150-mile Sand Marathon in Morroco. The race includes a full marathon, and a 50-mile day, and others as well across varying terrain. The race has to be run while carrying all their equipment on their backs and getting only 9 liters of water a day. Again, the old fort, the desert, and the peculiar, imported form of ritual play by hardy adapters could be from Dune. Where one would think survival would be enough, more is achieved, but always by staying close to the severe limits of nature. My comparison may be fanciful, but I can’t help but think that these photos are displayed for reasons that go beyond being visually distinctive or documenting unusual forms of recreation. They might also be images of a possible future. That would be a future not on some distant planet, but on this one, should it become ruined by some combination of unrestrained emissions, deforestation, warfare, and other forms of ecological destruction. Photographs by Ahmed Masood/Reuters; Pierre Verdy/AFP-Getty Images.